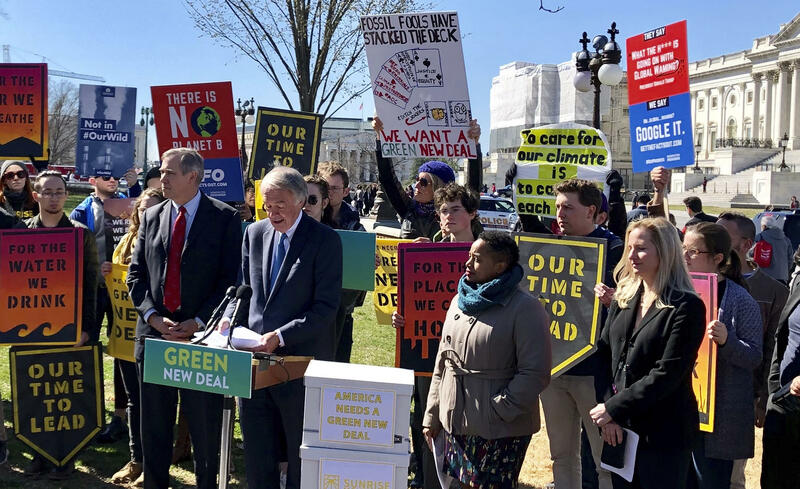 Sen. Edward Markey, D- Mass., speaks at a rally for the Green New Deal on Tuesday outside the Capitol in Washington. The deal failed to advance in the Senate. The Senate failed to move forward with Democrats' "Green New Deal," but the partisan clash over the controversial environmental plan is likely to be a continuing theme ahead of the 2020 election. The measure needed 60 votes to advance but was blocked when all Senate Republicans and four Senate Democrats opposed it. The rest of the chamber's Democrats voted "present." Senate Republicans forced a vote on the proposal Tuesday as part of an ongoing effort to turn the provocative climate change resolution into a wedge issue in the 2020 elections. Democrats say the GOP gambit carried its own political risk of mocking an issue that is a priority for a growing number of Americans. "I think it's a real stupid political move for them to show how cavalier they are about climate change by playing games with the Green New Deal," said Sen. Chris Murphy, D-Conn., ahead of the vote. "If they don't like the Green New Deal, fine, put up your own idea. It smells so disingenuous, especially to young voters. I think it's a really dumb move for them to mess around with this." All 53 Republicans oppose the Green New Deal. Most Democrats decided on a strategy to vote present led by Minority Leader Chuck Schumer, D-N.Y. "I'm for it, but I have no problem voting 'present,' " said Murphy. Schumer wants Democrats to run more aggressively in favor of climate change policies going into 2020, although he conceded in an interview with The New York Times earlier this month that the exact legislative form that will take is still up for debate. "It's going to take us a little while to come up with a consensus that works," he said. Senate Majority Leader Mitch McConnell, R-Ky., announced last month that he would put the resolution authored by New York Democratic freshman Rep. Alexandria Ocasio-Cortez and Sen. Ed Markey, D-Mass., up for a vote. Republicans are trying to elevate the freshman lawmaker, who has described herself as a democratic socialist, and her ideas as emblematic of the Democratic Party going into 2020. "In recent months our nation has watched the Democratic Party take a sharp and abrupt left turn toward socialism," McConnell said earlier this month. "A flawed ideology that has been rejected time and again across the world is now driving the marquee policy proposals of the new House Democratic majority, and nothing encapsulates this as clearly as the huge, self-inflicted, national wound the Democrats are agitating for called the Green New Deal." The National Republican Senatorial Committee has also started using Ocasio-Cortez in attack ads similar to the way the party campaigns have run against House Speaker Nancy Pelosi, D-Calif., for years. In a recent tweet attacking Rep. Joaquin Castro, D-Texas, who is considering a run against Republican Sen. John Cornyn, the NRSC said Castro "votes with AOC 94% of the time." Castro is a co-sponsor of the Green New Deal. House Republican candidates are also using Ocasio-Cortez and the Green New Deal in attack ads, like this one released Monday by former Rep. Karen Handel, R-Ga., who lost in 2018 and is seeking a rematch for a suburban Atlanta district. The Green New Deal is a loose set of ambitious goals outlined in a nonbinding resolution that calls for a global goal of achieving net zero carbon emissions by 2050 — but no policy specifics on how to get there. It is also an economic plan, which calls for massive federal investment, enhancing the social safety net, and millions of new jobs to overhaul the energy and infrastructure industries in the U.S. Critics have seized on the resolution's call for a "10-year national mobilization" to work toward a series of goals including "meeting 100 percent of the power demand in the United States through clean, renewable, and zero-emission energy sources." But even some of its sponsors, like Minnesota Democratic Sen. Amy Klobuchar, don't regard that marker as a hard deadline, instead saying the resolution is "aspirational." Republicans on Capitol Hill have also seized on a series of talking points Ocasio-Cortez's office accidentally circulated about the resolution that included financial support for Americans "unwilling to work" and for policies like building out high-speed rail so "air travel stops becoming necessary." Her office said it was an old, working draft that was not intended for circulation, but it was a self-inflicted political hit that gave critics an easy line of attack. Senate Republicans have been attacking the Green New Deal for weeks. "To put it mildly the Green New Deal is ambitious. To frame it more accurately, it is an unworkable pie-in-the-sky attempt to reshape every aspect of everyday Americans' lives," Sen. Chuck Grassley, R-Iowa, said on the Senate floor. Conservatives have rallied around an analysis by the right-leaning American Action Forum that estimates the Green New Deal would cost between $51 trillion and $93 trillion over a 10-year period. Senate Republicans are framing it as an expensive government takeover of American life as it exists today. "This Green New Deal — this big government takeover of the economy — it is masked as an environmental proposal. To me, it is radical," said Sen. John Barasso, R-Wyo. The GOP strategy is intended to divide Democrats, but senators have offered a collective shrug at McConnell's vote strategy. "The people are on our side as it relates to climate change and I think there's no reason to be defensive about what we want to accomplish," said Sen. Brian Schatz, D-Hawaii. "Republicans have no plan at all as it relates to climate change, and that's not a rhetorical flourish, that's not a partisan statement. They literally have no bill and they have no plan. They're just sort of goofing around." But at least one Senate Republican, Lamar Alexander of Tennessee, is offering a counterproposal to combat climate change, which he called "a New Manhattan Project for Clean Energy" in a Monday Senate floor speech. It is a five-year plan that includes 10 "Grand Challenges" to reduce carbon emissions and create cleaner energy sources. "I believe climate change is real. I believe that human emissions of greenhouse gases are a major cause of climate change," Alexander said. "And I believe the Democrat cure for climate change, their 'Green New Deal,' is so far out in left field that no one is going to take it seriously." Alexander is not seeking re-election in 2020. Democrats' "present" vote strategy had the support of climate change activists, including the nascent Sunrise Movement, a coalition of young activists who have recently been storming lawmakers' offices on Capitol Hill in support of the Green New Deal. A spokesman for the group told NPR the Senate vote was "a sham." Democrats are emboldened by growing public consensus that climate change caused by human activities is a serious problem requiring action. A December 2018 NBC/Wall Street Journal poll found that two-thirds of Americans, 66 percent, believe action is needed to combat climate change — an upward swing of 15 percentage points since 1999. But that change in attitude has largely come from the left and middle: 71 percent of Democrats (up 42 percentage points since 1999) and 48 percent of independents (up 22 percentage points since 1999) see combating climate change as an immediate concern. Only 15 percent of Republicans do — the same share of Republicans who felt that way 20 years ago. The Senate is going to take a vote today or tomorrow on the Green New Deal. That's a big-picture plan put out by Democrats to help combat climate change. Republicans want to turn it into a wedge issue in the 2020 election. Here's how Iowa Senator Chuck Grassley sees it. CHUCK GRASSLEY: It's an unworkable, pie-in-the-sky attempt to reshape every aspect of everyday Americans' lives. MARTIN: Democrats say the Senate vote is an effort to try and divide them on an issue they say requires urgent action. NPR congressional correspondent Susan Davis joins us now. Hi, Sue. SUSAN DAVIS, BYLINE: Good morning. MARTIN: So Republicans control the Senate. Republicans overwhelmingly disapprove of the Green New Deal. Why is Senate Majority Leader Mitch McConnell bringing this to a vote? DAVIS: It comes down to those three words we hear so often these days, Rachel - Alexandra Ocasio-Cortez. DAVIS: (Laughter) So she is, of course - she's the New York freshman Democrat. She has a lot of ideas of where she'd like to see the Democratic Party go and where the country should go. And Republicans are doing their part to try and elevate her ideas going into the 2020 elections. The Green New Deal is essentially her vision statement for combating climate change. Ed Markey, a Democrat in - from Massachusetts, has the companion resolution in the Senate. The Green New Deal is also an economic plan. And that's where Republicans are really hoping to seize on this debate. They're trying to frame it as a massive government takeover of your life. And it's part of their push to put - to say that the Democratic Party is moving to the left. And they're already using her and her ideas in campaign ads in House and Senate races two years from now. MARTIN: So Democrats though feel differently, clearly, than Republicans. All six of the Senate Democrats running for president have co-sponsored the Green New Deal. Do voters really have a grasp of what it is, though? DAVIS: Well, I mean, this is the frame that I think it's going to come down to. Is this socialism, or is this economic opportunity? And obviously, Republicans are trying to define it in the socialism frame. And they see this as trying to take - make Democrats take a tough vote. The thing is I've talked to a lot of Senate Democrats in recent weeks, and they've kind of collectively shugged (ph) this maneuver off. Democrats all plan to vote present today or tomorrow when it comes up as a form of protest. This is all predestined to fail. I talked to Connecticut Senator Chris Murphy, who told me he thinks Republicans are overplaying their hand. This is what he said. CHRIS MURPHY: I think it's a real stupid political move for them to show how cavalier they are about climate change by playing games with the Green New Deal. If they don't like the Green New Deal, fine. Put up your own idea. But it really just - it smells so disingenuous, especially to young voters. DAVIS: So Democrats just say Republicans look like they're mocking this issue. And that could hurt them with voters, especially independents who care a lot about climate change. MARTIN: So what do we know about where the country is right now more broadly when it comes to the debate over climate change? DAVIS: So the latest national NBC Wall Street Journal poll had some really interesting data comparing the issue from 1999 to today. Today, overwhelming numbers of Americans, two-thirds, believe climate change is real and action is needed to combat it. But that movement, that change in attitude, has come entirely from Democrats and from the center, from independents. What has not changed is Republicans. The poll showed that in 1999, just 15 percent felt that climate change was an urgent issue. That is the exact same number, 15 percent, who said the same today. There has been no change in attitudes on the right. MARTIN: NPR's Susan Davis. Thanks, Sue.